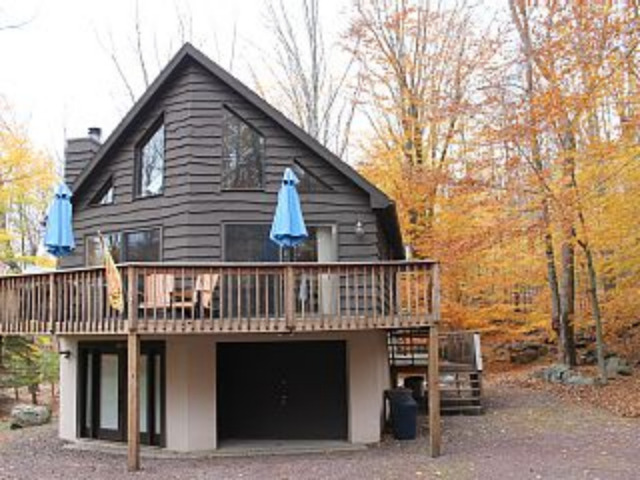 Lake Ariel Chalet Rental 4 bedrooms, 2 bathrooms, sleeps 10 adults. Cozy prow front chalet located in the gated community of Indian Rocks. Our lake access home features four rustic bedrooms, two full bathrooms & kitchen with new appliances - including stove, microwave and dishwasher. Counter seating for five around a large open space. The attached dining room contains a spacious woodsy table with ample seating for six. The living room boasts a colorful stone faced fireplace with a 55' LED HDTV & comfortable seating for your entertaining and enjoyment. The home is cooled by two large "through the wall" air conditioning units.Game room includes arcade, air hockey & table tennis. Please see www.homeaway.com listings 3633518,4085361.